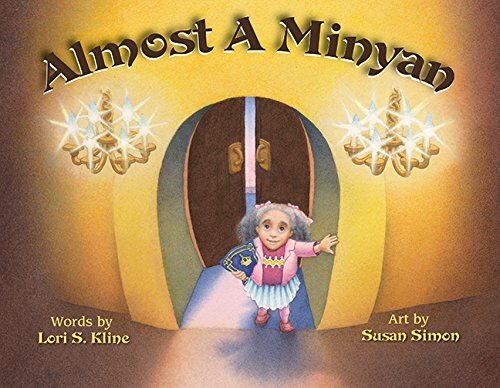 Almost a Minyan is the lovely story of a young girl whose devout father visits the shul daily for public worship. But if fewer than ten people are present, they do not have a minyan and are therefore unable to say certain prayers, or read the Torah. The girl is not yet old enough to attend worship at the shul, but she looks forward to the day when she too, will be able to help reach a quorum. Nothing makes her father happier than when they make minyan. But after her grandfather passes away, it seems nothing will make her father happy ever again. Almost a Minyan is written in rhyme and denotes the bonds of family and faith in a reverent and loving way. Author Lori S. Kline has crafted a book filled with the warmth of time-honored traditions and unfailing devotion. This book, with wonderful illustrations by Susan Simon, is a cultural gem that will connect with readers of all ages. Almost a Minyan is recommended for home and school libraries and has earned the Literary Classics Seal of Approval.